There are a variety of portable pitching mounds on the market and being placed with the responsibility of choosing one can be more challenging than most people would expect. I have a few standard questions I would recommend customers ask when seeking out a new portable mound. I have shared these below in hopes of making your purchase a successful one for you and your organization. Is the portable mound going to be used for actual game play or will it just be used as a training tool for pitchers? Can cleats be used on it? If you plan on using this mound for games or tournaments make sure that you ask the seller if the mound has been certified or approved for such use. What age groups will be using your portable mound? The age group or league of your team determines what the height of your mound should be. Visit our ONLINE FIELD DIMENSIONS to find the official measurements for your league’s governing body and level of play. The online guide is free, or you can purchase the printed version of our field dimensions guide for only $9.95 (a great item to keep posted in the equipment storage locker). Just choose your league from the League Menu in the right side bar and you’ll see all the necessary field dimensions, including the mound-specific data for mound height, radius, etc. Click on each letter reference to see what your league needs. Will it be used primarily indoors, outdoors or both? Most portable mounds have artificial turf covering them, but it’s important to ask how the mound will react to being left out in the elements. That should be determined by examining the backing of the turf and what’s lays underneath the turf. I always recommend buying a mound tarp if you’re going to keep the mound outside and exposed. Mounds can be a large investment for a lot of teams and I think an inexpensive 6oz tarp is well worth it to protect that investment. How much does it weigh? Can I see the specs? How easy is it to transport? These are important questions to determine if the mound will fit in certain areas, be easy to move around, and how much space you will need for storage. Reference our Portable Mound Comparison Guide to compare mound weights and other key information. Does the mound have a warranty? I recommend asking that before you buy any large product for your team. At Beacon, we have The Beacon Promise, which includes a 100% money back guarantee on all products. We’re one of the only companies to follow that business model so if you order from someone else make sure to ask how they will handle it if you were dissatisfied with the product. Portable mounds come in many varieties and it’s important you get assurance that it will perform to your team or leagues expectations. 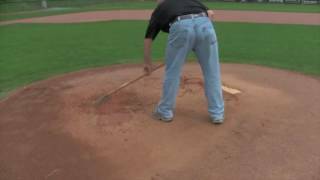 Our sales staff at Beacon is well trained on all of our portable mounds and we’ll be happy to help you with any mound questions you may have.